A forgotten recipe! I remember writing out this card; I was 16 and on a trip to Connecticut with a high school friend; we were visiting her aunt and her aunt’s best friend and roommate, who I realized some years later was really her partner. I have such clear memories of that trip; they were very gracious hostesses, taking us on a tour of the prep school where one worked and then on a docent-led tour of Yale. They took us on the train into New York where we looked out over the skyline from the top of the World Trade Center then ate an early dinner at Tavern on the Green. They even took us to spend the weekend on the Cape, soaking up the energy of Provincetown in the morning, traipsing through the dunes at the very windy Cape Cod National Seashore in the afternoon, and grilling steaks at our small rental house in West Dennis in the evening. I must have really enjoyed their cooking, because before we left they offered to share several recipes with me, which I copied sitting at the small kitchen table in their condo. One was pork chops placed on top of sliced potatoes in a casserole dish, topped with two cans cream of mushroom soup, and baked. The other was similar – chicken breasts on top of Minute Rice with a splash of orange juice and two cans cream of celery soup, then baked. I made both recipes often after we were first married and trying to figure out what the heck to make for dinner. This blueberry muffin cake was our breakfast one day, and I remember how moist and delicious it was. 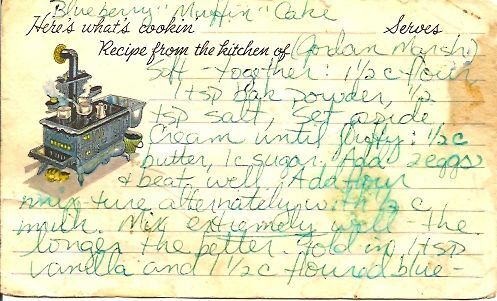 The recipe is attributed to Jordan Marsh, the former Boston department store famously known for their blueberry muffins. I don’t know how authentic it is, but I do know that is is quite tasty as well as a reliable crowd pleaser. Do mix longer than you think is necessary for the best taste and texture. A moist and flavorful cake that's perfect for breakfast or tea. Sift together flour, baking powder, salt, and set aside. Add flour mixture to wet ingredients alternately with ½ cup milk. Mix extremely well - the longer the better. Fold in 1 tsp vanilla and 1½ cups floured blueberries. Pour into well-greased 8" square or round pan. Bake 350 degrees 35 - 40 minutes. I remember this very well. It is my favorite blurberry recipie of all time, There is really something different about it. I, too, ran across it the other day and pulled it out to make. Thanks for all the wonderful memories. Amanda Hesser’s “The Essential New York Times Cookbook” has a slightly different version of this recipe for you to try. It calls for 1/4 cup of fresh crushed blueberries instead of the 1/2 cup mine calls for. I did make this after I put up this blog post. It was not as good as I remembered; a cautionary tale when you go chasing down the flavors of your childhood.